Cut vinyl down to size. Cut vinyl accurately and easily using a computer compatible vinyl cutter. 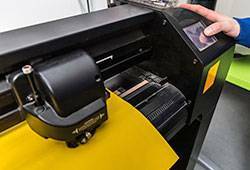 Vinyl cutters are computer-controlled devices used to cut vinyl, transfer paper, card, rhinestone and most other materials up to 1.5mm thick. Used in conjunction with SignCut Pro or FlexiStarter 11 software, designs can easily be created on a computer and cut from vinyl using our range of vinyl cutters. Complete the process with a heat press to transfer vinyl designs onto a wide range of clothing and materials. Vinyl cutters are fantastic for creating heat press transfer cut-outs, t-shirt vinyl, car decals, van signage, shop signage and wall art. MonsterShop stock a range of super bundles that contain every element you’ll need to press great personalised items using vinyl.